Whether it’s your rug, your couch, or an awesome scratching post, your cat needs to scratch something. Here’s what we know about why cats scratch. Instead of growing longer like human fingernails, your cat’s claws constantly grow new layers. Like the layers of an onion, these claw sheets build up, eventually becoming dull and ragged. Cats scratch to slough off the old outer layers and reveal the fresh new claws underneath. As they scratch, cats release pheromones from the scent glands in their paws, leaving an unmistakable territorial mark. The full arm extension and movement of scratching gives your cat the opportunity to stretch out their bodies, massaging their muscles and keeping them flexible. Because scratching is part of being a happy, healthy cat, it’s important to provide an appropriate place for your cat to engage in this essential behavior. Without a scratching post, your cat will have to turn to other surfaces, like carpets, curtains, yoga mats, and walls. What makes a scratching post great? In this article, we’ll take a look at the qualities of the best scratching posts and get to know the top 5 best scratchers on the market. The best cat scratching posts are made from durable, satisfying materials. Cats need materials that they can sink their claws into, that are easy to rip through, and which will have a satisfying sensation as their claws tear across the surface. At the same time, the scratching post needs to hold up to years of vigorous use. A few months of use shouldn’t leave your cat’s scratching post a shredded mess. Let’s take a look at some of the most popular scratching post materials and evaluate how well they work. While some cats enjoy ripping up carpet, either as part of a scratching post or installed in your home, carpet is generally unsatisfying. Instead of ripping through the soft fibers, your cat’s claws will likely snag in carpet loops, and that’s never a pleasant experience. An unsatisfying scratching experience isn’t the only drawback of a carpet-covered scratcher. Carpeted scratching posts blur the difference between approved and non-approved scratching surfaces. If you don’t have any carpet in your home, a carpeted scratching post might be acceptable. If you have carpeted floors, a carpeted post only creates confusion. Made from the agave sisalana plant, sisal rope has a rough feel that makes it a popular choice for cat scratching posts. Some cats are jarred by the ridged texture of a sisal-wrapped post, preferring something that encourages longer, smoother scratches. Because sisal rope is widely available and simple to use, it’s a popular choice for DIY’ers making their own scratching posts. When your sisal rope scratching post falls apart after months or years of use, it’s easy to re-wrap it. If you choose a sisal post, investigate the product to ensure that you choose a good one. Select a tightly-wrapped and well-secured scratching post that can withstand serious use. Humble cardboard is a big hit among cats, who love the claw-feel of corrugated cardboard. It shreds readily, which feels satisfying under the claws. Some also speculate that cats like the sound of cardboard being ripped. While cardboard is fantastic from the feline perspective, it’s problematic for humans. It’s important to choose only high-quality cardboard scratchers. On the low end of the price spectrum, cardboard scratchers are about as decorative as a cardboard box. If aesthetics are a priority, you’ll likely have to spend a little extra money. Because they shred so easily, less durable cardboard scratchers release brown flakes that can spread around your house. It’s important to buy a high-quality cardboard scratcher that won’t be ripped to bits in a few months. Instead of a long strand of sisal rope, some scratching posts feature this woven sisal material. Unlike sisal rope, which has a jarring ridged texture on the scratching post, sisal fabric allows your cat to create long, satisfying strokes down the surface of the scratching post. It’s more durable than sisal rope, carpet, or cardboard. The best cat scratching posts are strong and stable. If your scratching post is exciting enough to elicit body slams, leaps, and rigorous scratching, it has to have the stability to withstand your cat’s passionate attentions. Make structural integrity a priority when choosing a scratching post. Seek out posts that are screwed, rather than glued, together. Remember that you don’t want a scratching post that could tip over while your cat is using it. This becomes particularly important when evaluating a tall scratching post. A towering scratching post needs a base that balances out its height. The base should be substantial, weighty, and well-built. The best cat scratching posts have a cat-friendly design. Remember that scratching isn’t all about claws and paws – your cat uses scratching as an opportunity to stretch out the muscles and tendons in their entire body. That’s why it’s important to choose a scratching post that’s long enough to allow your cat to achieve a complete stretch. Choose a scratching post that measures at least 1.5 times the length of your cat. This gives them enough scratching space to extend their arms and get a good stretch throughout their body. This doesn’t necessarily mean that your cat needs a tall scratching post. Some cats love to reach up and scratch vertically, while others prefer to get long and low near the ground. 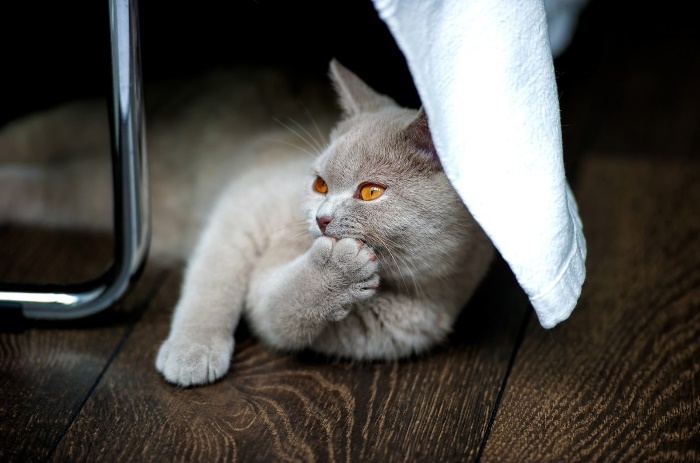 If your cat has done any destructive scratching, you’ll likely be well aware of their preferences – do they scratch the walls or shred the carpet? Do they use both? 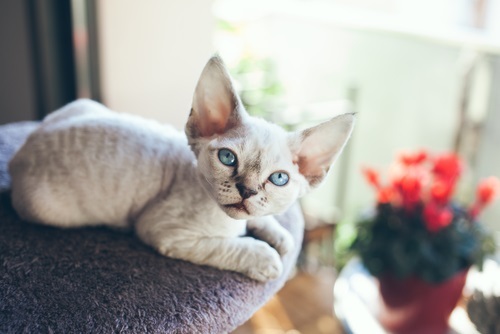 You might want to install multiple scratching posts in your home or choose posts with a variety of surfaces, allowing your cat to extend their limbs in multiple ways. The best cat scratching post fits into your home. Whether you’re looking for a scratching post that looks beautiful and aligns with your decorative tastes or just need one that won’t eat up floor space, don’t be afraid to think about your aesthetic needs when shopping for a scratching post. Chosen based on high cat approval ratings, functional and sturdy design, and high-quality materials, the products on our list of the top 5 best cat scratchers are all worthy choices to satisfy your cat’s scratching needs. Rated as the best scratching post on the market by The Conscious Cat and Business Insider, this Amazon bestseller is a well-loved piece that leaves both humans and cats impressed. On Amazon, the Ultimate Scratching Post has over 7400 customer reviews and a healthy 4.6 out of 5 star rating. Customers describe it as durable, sturdy, and made with a cat-friendly design. Thanks to its sturdy design and brawny 16” x 16” base, this scratching post can withstand rigorous scratching, along with climbing, jumping, and playing. If your cat likes climbing the post, they might also like to use it with the optional perch designed to fit on top of the scratching post. This cardboard scratcher has a simple wedge design that cats love. The angled scratching pad provides a great stretch and is reversible and replaceable for years of use. It features a cubby hole and built-in toy, making it a multifunctional addition to the home. 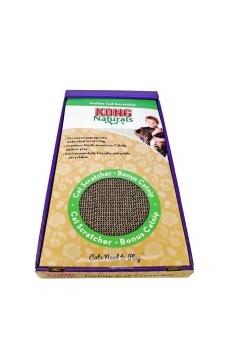 To help entice your cat to use the Kong Naturals scratcher, the product comes with mountain-grown catnip. At less than $10, this is a winning low-price option, but it does have a couple of problems. Because it’s made from lightweight cardboard, the scratcher can slide around during use. You may want to weigh it down to keep it in place during vigorous scratching sessions. If your cat likes to stretch up while they scratch, this inclined design won’t give your cat the intense vertical stretch they crave. Although this list’s top pick was tall, this scratching post from MidWest Feline is nine inches taller, making it ideal for large cats who need plenty of vertical scratching space. 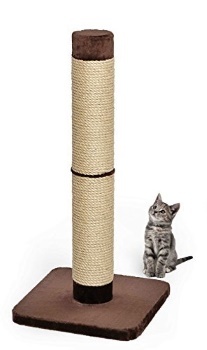 If you have a lanky cat who doesn’t seem satisfied by anything shorter or flatter, try this 41” cat scratching post. 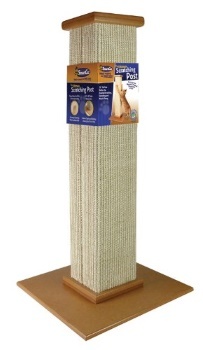 This scratching post’s height is balanced by a 19” x 19” base coated in soft faux-fur. The stable base makes it appropriate for vigorous scratching and adventurous climbing. Thanks to the faux fur top, this scratching post doubles as a comfortable lookout tower for your cat. This scratching post would be better if it was made with sisal fabric. Instead, it’s wrapped in sisal rope. Although some cats prefer the wrapped feel, most will find that the rope is less durable and has an inferior claw-feel. Wall mounted scratching posts are a great choice for people with limited floor space. These pieces are sleek and unobtrusive, helping to maximize your space. 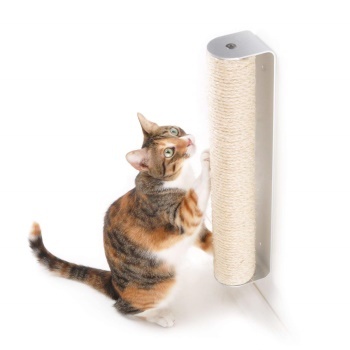 If your cat is a vertical scratcher who loves to get tall as they stretch and scratch, a wall mounted scratcher will be a satisfying choice for them. The scratcher measures 18” tall, which is a little bit shorter than the ideal scratching post. You can maximize your cat’s stretch by positioning it at the ideal height on your wall. With its curvaceous peanut-shaped design, this combination scratcher-lounge is a piece of cat furniture that looks good in your home. The entire piece measures 34” long and 10.5” wide, giving your cat plenty of room to lounge and scratch. The curved design allows your cat to stretch out and scratch from multiple angles. It’s made from durable cardboard and is reversible for longevity. Customer reviews indicate that this scratcher has an average lifespan of about two years. Not satisfied with the cat scratching posts that are currently available for sale? You might want to make your own scratching post instead. Homemade scratching posts range from complex DIY projects to simple ones that require little more than a pizza box and glue. This tutorial explains how to make your own sisal rope scratching post. If you prefer something a little bit simpler or if your cat is a cardboard scratcher enthusiast, you can also make a simpler design using a pizza box. Although the person who made the following video said that they created their scratcher using a used box, you might prefer to request a clean box the next time you’re in a pizza restaurant. How do you make your cat use their new scratching post? Remember that your cat uses the scratching post as an opportunity to mark their territory. It’s a good idea to place the post in socially significant parts of the home. Your cat’s previous scratching behavior can show you where they like to scratch. If your cat is known to scratch a couch arm or a specific patch of carpet, consider placing the new scratching post near one of those problem areas. Once you’ve selected a location for the scratching post, it’s time to entice your cat to use it. If you’ve chosen size and style that matches your cat’s interests, your cat’s natural scratching instinct should do most of the work. But if you’re concerned about your cat’s hesitance to use the post, there are a few things you can do to push them in the right direction. Spritz the scratching post with catnip spray. This will encourage your cat to spend time around the scratching post and, eventually, will entice them to dig in their claws for the first time.